Since writing the previous post, I have found abundant evidence that the text of the "Theology of Arithmetic" was in Venice at the time of the design of the Sola-Busca. I have posted it at viewtopic.php?f=11&t=613#p8936--on a separate thread, since it is of more general interest than just the Sola-Busca. I am now going to see what happens when I extend my discussion beyond the numbers 1-10 to include the cards numbered 11-14 in the Sola-Busca, in each suit. I am referring to the court cards, Pages through Kings. Unlike most decks, the numbers are actually on the cards. For the Knights, Queens, and Kings, there are also the names of classical heroic figures inscribed on the pictures. For Pages, there is just the number. Here there is some literature specific to the SB: notably, there is the material on Tarotpedia and the supplements to it on this thread by Marco, viewtopic.php?f=12&t=530&start=0#p7367. I will start with the pages. In Neopythagoreanism, the numbers start over after 10. Ten is the totality, the All. Eleven is just the One again. 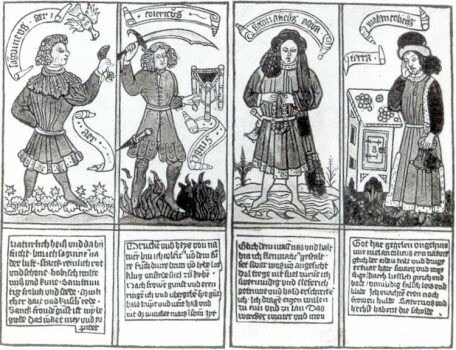 So pages are the beginnings of something: they are the apprentices in the four trades shown by the suit signs, namely, soldiering, monetary transactions, and two others that are not so clear. Batons in the pip cards are displayed much like swords are, but carved out of wood; they are clubs, in other words. Clubs or cudgels were the weapons granted to peasants, who were forbidden to carry swords. A cup or chalice could be for drinking or for receiving the sacrament. Here are four other pages, showing some of these uses, these are "Italian, 15th or 16th century," according to Kaplan, Vol. 2, where they appear. Coins is holding his suit-symbol up as though it were a piece of merchandise he were selling. He is an apprentice to either a merchant, whose wares he sells, or a banker, whose money he seeks to loan. Cups is a drinker, and the other two are soldiers, swords more aggressive than batons. Swords plays a lute; Coins plays with birds, at least one of which is a falcon on its perch, [while carrying a purse--part in red, here and elsewhere, added 10/25/10]; Cups is tending either a fire or "blooming plants" (Di Vicenzo p. 54) coming out of his suit-symbol, while carrying a purse; and Batons is walking somewhere, carrying a purse by its strings, what looks like a letter in his boot, and a stiletto in his belt. There is also the emotional mood conveyed by the bodies and especially faces of the young men here. Swords and Coins look rather sad or at best contemplative. Cups is simply observing, perhaps with a certain amount of wonderment. And Batons is rather jaunty, with a slight smile. Marco says that the boy holding the cup has the phlegmatic attribute of being elegantly dressed. He does not look to me much more elegantly dressed than the others. And I have not seen where that is an attribute of that temperament. In fact in one image I found (http://www.designboom.com/history/a_m2.html), she is dressed in rags. After all, she is lethargic. At http://emblem.libraries.psu.edu/Ripa/Im ... pa015a.htm and http://emblem.libraries.psu.edu/Ripa/Im ... pa015b.htm (found by Bernice on ATF), the phlegmatic figure wears a fur coat, but it is not described as an elegant one; and the black cloth Ripa says he has around his head is far from elegant. He wears fur because it is cold and doesn't want to catch a cold, with all the phlegm involved. Or maybe he's already sick. The phlegmatic temperament is cold and moist. In Batons, the purse again is a sign of melancholia. I cannot associate the letter in the boot with any temperament. It might mean that he is delivering a message, but that's just a guess. There are other problems with what we have so far. If three of the figures have purses. are all of them melancholy? Another problem: you can see above that falcons as well as lutes were associated with the sanguine temperament. 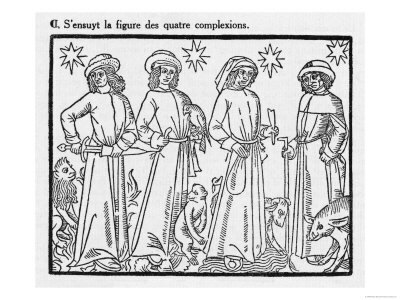 For another pertaining to falcons, here is a 15th century woodcut of all four temperaments reproduced by Laurinda Dixon, Bosch, p. 81. Moreover, the suit-signs themselves suggest, to some people, specific temperaments. The page's cup, in the 16th century Italian card I showed earlier, is for holding liquids; and water is associated with the phlegmatic temperament. Water is also the phlegmatic temperament in the woodcut I already posted, there associated with the calming effect of saying the Rosary. For convenience, here is the woodcut again. In addition, the shape of the cup may be functioning as a hieroglyph. Such a vessel, with one narrow spout, occurs in the Hypnerotomachia, where it means "little by little," according to Hornung (Myth of Egypt and its Hieroglyphs, p. 68); such a meaning aptly describes the slowness of the phlegmatic temperament. Coins, the objects in purses, are associated, in this woodcut, with misers, who are melancholy. Swords are associated with anger, i.e. choler, as in the same woodcut. These suit assignments are not the only ones possible. There is also Gosselin, 1582, quoted by Ross (viewtopic.php?f=12&t=530&start=0#p7412); but his correlations are to the ordinary French-style suits, a bit far afield for the Sola-Busca. In any correlation of French to Italian suits (there are two, depending on whether diamonds = coins or batons), they come out as a third system. Let us not complicate things further! So our SB Page of Swords is both choleric (as sword) and sanguine (lute); Cups is phlegmatic (water, possibly purse), maybe melancholic (purse), and either choleric (fire on cup) or sanguine (if plant on cup); Coins is both sanguine (falcon) and melancholic (as money: suit symbol and purse; and Batons is melancholic by attribute (purse), but his face says sanguine. So perhaps we may postulate that the attribute is meant to affect the young man's temperament with its opposite, and so achieve a kind of balance in the soul. Thus the choleric individual, as indicated by his suit-sign of Swords, plays on his lute to dissipate his anger and achieve the calm of the phlegmatic or sanguine character. 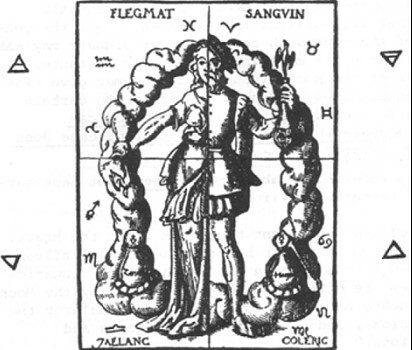 The phlegmatic person, indicted by his suit-sign of Cups, could be seen the same way: he puts a fire in his cup, so as to warm himself up, give him more dry and hot energy to combat the cold and moist, and so make himself more active and energized. Or he is more straightforwardly watching a plant bloom little by little. The melancholic person, indicated by his suit sign of coins, plays with falcons so as to achieve a more sanguine outlook. And the sanguine person, Batons by a process of elimination but also indicated by his cheerful expression, will soon be robbed of his purse, and his message will be sold to the highest bidder for information. His stick and his stiletto, however secure they make him feel, are no match for robbers armed with swords, spears, or even bigger clubs. He will become melancholic, as his purse predicts, but also less naive. At least that is one way of interpreting the cards. But it does not come out with the same suit assignments as Marco does. He has studied the attributes of the other court cards and come up with a different set of suit-temperament correspondences, for Coins and Batons. So perhaps we will have to change how we tell two parts of the story. The depressed young man plays with his birds, and the coins or discs signify his resulting richness of spirit, sanguinity. We identify the result, rather than the initial condition. with the card. It is the same with Batons. The young man with the purse will still be robbed, and his baton, as an ineffectual weapon against swords, signifies his resulting melancholia. However we tell the story, there are important psychological lessons to be learned by a person just staring out in life. And these four cards do, somehow, seem to be about the four temperaments. mikeh wrote: I am now going to see what happens when I extend my discussion beyond the numbers 1-10 to include the cards numbered 11-14 in the Sola-Busca, in each suit. I am referring to the court cards, Pages through Kings. Unlike most decks, the numbers are actually on the cards. For the Knights, Queens, and Kings, there are also the names of classical heroic figures inscribed on the pictures. For Pages, there is just the number. Whow ... that's nice, that you say that, I haven't noticed this earlier. In the theories of the 5x14 Bembo cards it was assumed, that the numbers of the trumps were originally based on the numbers 1-14 according an earlier number association to the usual suit cards. It was assumed, that 11= Fool was later modified to 0 and 14 = Judgment to the number 20. I have not yet discussed the SB Pages in relation to the "Etteilla" word-lists, as given in by Papus in the 1910 Tarot Divinitoire. Since that was helpful with the pips, I will repeat them here. I will also include what Eteilla himself says in his 1773 book, which is much less (http://books.google.de/books?id=CI85AAA ... &q&f=false, pp. 8-15). That book describes how to do cartomancy with a piquet deck, i.e. an ordinary deck from which the 2s through 6s have been removed. This is the only book of Etteilla's I have been able to find. I will distinguish between the two sets by using quotation marks around "Etteilla" for the Papus lists and without quotation marks for those in Etteilla's own book. "ETTEILLA" PAGE OF SWORDS, UPRIGHT: Overseer, Spy, Onlooker, Observer, Searcher, Connoisseur, Intendant.—Examination, Note, Remark, Observation, Annotation, Speculation, Count, Calculation, Computation—Learned, Artistic. REVERSED. Without Warning, Sudden, Suddenly, Suddenly Interrupting, Astonishing, Surprising, Unexpectedly.—Improvise, Act and Speak Without Preparation, Compose and Recite Straightaway. In addition, there is what Etteilla himself says in his 1773 book for the Valet of Spades: "Ambassadeurs, Envoye. R. Espion, bien des gens le font eux-memes par leur imprudence ou leur trop de paroles": i.e. "Ambassadors, Envoys. Reversed: Spies, people who show themselves by their imprudence or too many words." On the surface there is nothing Neopythagorean about Swords, i.e. nothing suggesting the beginnings of things, except perhaps the "acting or speaking without preparation" in the Reverseds--a negative trait in 1773, more neutral in Papus. "ETTEILA" PAGE OF COINS, UPRIGHT: Dark Young Man, Study, Instruction, Diligence [Application], Meditation, Reflection.—Work, Occupation, Apprenticeship.—Scholar, Disciple, Student, Apprentice, Amateur, Pupil, Speculator, Negotiator. REVERSED: Profession, Superfluity, Magnanimity, Luxuriousness, Sumptuousness, Splendor, Abundance, Myriad.—Liberality, Kind Deed.—Generosity, Charity.—Crowd, Multitude.—Degradation, Wasting, Pillage, Dissipation. "ETTEILLA" PAGE OF CUPS, UPRIGHT: Fair Young Man, Studious.—Student, Application [Diligence], Work, Thought, Observation, Consideration, Reflection, Contemplation, Job.—Business, Profession, Employment. Reversed: Tendency, Bent, Proclivity, Inclination, Attraction, Taste, Sympathy, Passion, Affection, Attachment, Friendship.—Heart, Craving, Desire, Appeal, Promise, Seduction, Invitation, Agreeableness.—Flattery, Cajolery, Fawning, Sycophancy, Praise, Approbation.—Inclined towards threatening ruin and complete destruction. In his 1773 book Etteilla says of the Page of Hearts, "Garcon blond. R. Chatain blond": "blond young man. Reversed: light brown hair" (if that's what "chatain blond" means). These meanings simply relate to the color of the suit. The "Etteilla" Pages of Coins and Cups both suggest apprenticeship, with their emphasis on study, and thus do suggest the Neopythagorean Monad, standing for beginnings. The contrast between "dark young man" for clubs and "blond young man" for hearts in Etteilla's 1773 book suggests to me that these two were seen as somehow similar, i.e. on the same continuum, but opposite. "ETTEILLA" PAGE OF BATONS, UPRIGHT: Stranger, Unknown, Extraordinary.—Strange, Uncommon, Unusual, Unheard Of, Surprising, Admirable, Wonderful, Marvel, Miracle.—Episode, Digression, Anonymous. REVERSED: Announcement, Instruction, Opinion, Warning, Admonition, Anecdotes, News, History, Stories, Fables, Postmen [?] [Notiens], Education. In the 1773 book Etteilla says of the Page of Diamonds, which I think corresponds to Batons: "Militaire. R. Domestique": "Military person. Reversed: Domestic." The "Etteilla" word "stranger" for Batons might suggest a person at the beginning of a new phase in life, and so conform to the Neopythagorean model. It also fits my idea that the young man is on a journey; so the epithet "stranger" applies to him in his new location. The "Etteilla" Reverseds perhaps also have a reference to the note he is carrying in his boot,with the words "News," "Announcement" and "Postmen." Etteilla's word "militaire" would seem to fit Swords. Then there is the relationship to temperaments, in the "Etteilla" lists, compared to the SB. Cups, on Marco's account, corresponds to the phlegmatic temperament, I'm not quite sure what "phlegmatic" meant at that time, other than cold and wet. That makes sense in the context of the SB page, who appears to be standing in front of a stove; But looking at the "Etteilla" list, I get a different impression, that "phlegmatic" means wanting to have smooth, harmonious relationships (which fits Wikipedia's account). I see nothing of that in the SB card. The Reverseds for Coins relate to money, but suggest over-optimism rather than the general cheerfulness usually associated with the sanguine temperament. Such over-optimism is not apparent on the card--unless the man has just read his bank statement and is seeking to escape his bad mood by falconing. The Reverseds for Swords suggest a tendency to be impulsive, i.e. to act or speak without thinking, with "Imprudence or "trop de paroles", as the 1773 book has it. This is a sign of the choleric temperament. 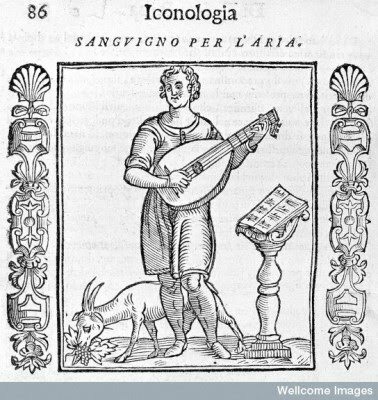 Playing the lute might counteract such a tendency; but nothing to that effect is in the "Etteilla" list. In Batons, on the other hand, if what the young man with the purse and the note needs is a warning to carry his things more discreetly; that is exactly what the "Etteilla" Reverseds prescribe. In general, there is not the easy correlation between between the word-lists and the SB cards that we saw in the pips. What correlations we see are something of a stretch. Perhaps what we are seeing is distortion over time; but it might also be that we are seeing mere coincidence. The SB Knights, Queens, and Kings get their significance primarily from the names on the cards. They refer to major characters in two separate but connected stories. One story is that of the fall of Troy and the subsequent slaughter of King Priam and his sons and daughters; the last to go is his youngest daughter Polyxena. The other story, a thousand years later, revolves around Olympias, the mother of Alexander the Great. Her given name was Polyxena, according to Plutarch ("On the Oracles at Delphi" 401); it was changed to Olympias after her husband Philip's horse won at the Olympian Games. She was considered a descendant of Neoptolemus, the first Polyxena's killer. according to Wikipedia (http://en.wikipedia.org/wiki/Olympias; but they don't cite a source). Neoptolemus was the son of Achilles, who was slain due to information about Achilles supplied by the first Polyxena. 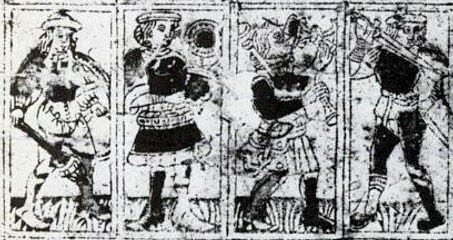 Tarotpedia does a great job of documenting the characters' histories in sources available at the time in Latin or Italian. The only one I am not sure about is Euripides' Trojan Women; according to WorldCat, it is not in the first published collection of Euripides' plays (1503 Venice) and wasn't published even in Greek until 1575 London. But its information is repeated in other sources, including Euripides' Hecuba. I have only a few additions. One is Olympias's original name. Another is saying how specifically Pallas connects to the story, drawing on the Aeneid; it is more than just a general connection to war. Also I think a little more could be said about Serapis, using Herodotus, and similarly with some of the other characters. Cups, Water, Phlegmatic: Natanabo (magic). Batons, Earth, Melancholic: Apolino (science). Now a few words of explanation, building upon Tarotpedia's source material. Sarafino is the god Serapis. He would likely be associated with the sanguine temperament because he is "the greatest of the gods of the Egyptians," as Plutarch says in his Life of Alexander--hence the most powerful, and likely the one from whom Nantanabo gets his magic powers. When the Persians first invaded Egypt (a different invasion from the one during Natanabo's time), the King killed the Apis bull, according to Book III of Herodotus's Histories (http://en.wikipedia.org/wiki/Cambyses_II). One may assume that Serapis (Osiris-Apis), to whom this bull was sacred, would have been more than willing to help Natanabo get revenge. Amone is the god Ammon, seen by the Greeks as the Egyptian equivalent to Zeus, as Tarotpedia quotes Cicero and Plutarch. Zeus’s attribute was the thunder-bolt, associated with fire, and hence appropriate for the choleric temperament. Zeus used it often when disappointed in mortals. In Greek myth, Zeus frequently lay with mortal women, who thereby gave birth to gods or heroes (e.g. Hercules, Perseus, Bacchus). So it is natural that he might lie with Olympias, as Natanabo predicts. He makes sure that his prediction comes true by impersonating Zeus himself, in the form of a serpent. Or at least that is how the legend came down. Olympias was said to be a member of a snake cult, according to Wikipedia (again no ancient source given). That is how Zeus begat Dionysus Zagreus with Persephone. When Alexander conquered India, he was consciously following in the footsteps of Dionysus, who in legend also conquered India. Natanabo is an Egyptian priest/king who flees the invading Persians, first invoking the aid of the Egyptian gods, no doubt including Serapis, and travels to Macedon. There he does his magic with its Queen, Olympias. He is associated with Water and Phlegm because of the ritual he does in Egypt to give him magical powers, drinking rain water from a certain “brazen shell,” as the English version of the "Alexandrian Romance" has it. That might be identical with the cup or the helmet we see on the card. Apolino is Apollo, the god of enlightenment, i.e. science, which is, e.g. in Durer’s “Melancholia I” under melancholy. Apollo’s relation to the story, in the sources that Tarotpedia quotes, is that (a) in the Trojan War, Achilles is killed in a shrine to Apollo, the killers having learned from his beloved Polyxena that he is vulnerable only in the heel; (b) in the story of the begetting of Alexander, Apollo warns King Philip that he must always honor the god Ammon, and also that he will lose an eye peeping through a keyhole at his wife lying with the god; and (c) Alexander in turn erects a statue to Apollo (I am,not sure from the wording in the source whether it was a statue of Apollo, or of himself in a shrine of Apollo). There may be a hint that Apollo guided the hand of Achilles' killer Neoptolemus. Serapis, Ammon/Zeus, and Apollo are powerful gods. I don’t see any relationship between them and the Neopythagorean Two. Natanabo is the exception. In the face of Ataxerxes’ attack on Egypt, this ruler of Egypt makes a temporary retreat and separates from the land of his fathers and their gods. He embodies the principle of separation from the One, while still longing for return. Nantanabo embodies the Dyad; but I don’t see the others in that position. In analyzing the pips, I was helped by looking at the “Etteilla” word lists. The parallels between the “Etteilla” and the SB cards opened up the possibility of the same traditiion being reflected in both the SB the “Etteila.” So now I will bring in the “Etteilla” lsits again. His 1773 book, being related to ordinary cards, doesn't include Knights. "ETTEILLA" KNIGHT OF SWORDS, UPRIGHT: Soldier, Man With a Sword, Man-At-Arms, Fencing Master, Swordsman.—Soldier From an Entire Corp or Army, Combatant, Enemy.—Dispute, War, Combat, Battle, Duel.—Attack [Address], Defense, Opposition, Resistance, Destruction, Ruin, Reversal.—Enmity, Hate, Wrath, Resentment.—Courage, Valor, Bravery.—Satellite [Attendant], Mercenary [Stipendiary].REVERSED: Incompetence, Ineptitude, Foolishness, Folly, Stupidity [Imbecility], Imprudence, Impertinence, Extravagance, Ridicule, Silliness.—Fraud, Swindling, Mischief, Cunning. Zeus/Ammon is a warrior-god, victor over the Titans. He is not as uniquely a god of war as his son Mars, but he still is one. Zeus, like all the gods, was known for his anger when things didn’t go his way or when he wasn’t worshipped properly. As Zeus, one would expect him to be given the rank of king. But it is only the Egyptian equivalent, and anyway, he wasn’t really involved. In the story, his name was used, presumably without his opposition, in the service of this sneaky warfare, namely, the begetting of Natanabo’s avenger Alexander. "ETTEILLA" KNIGHT OF CUPS, UPRIGHT: Arrival, Coming, Approach, Access, Reception, Entrance, Bringing Closer.— Similarity.—Advent, Approximation.—Accession To.—Flow.—Comparison. REVERSED: Mischief, Villainy, Duplicity, Cunning, Artifice.—Keenness, Shrewdness, Suppleness, Fraud.—Subtlety, Irregularity.—Evil Deed. Natanabo definitely fits this list, in the sense, for the Uprights, of arriving in Macedon. For the Reverseds, his advice to Olympias is certainly cunning, duplicitous, and fraudulent, if in fact it was he who lay with Olympias, in the guise of a god. "ETTEILLA" KNIGHT OF COINS, UPRIGHT: Utility, Serviceable, Benefit, Gain, Profit, Interest.—Profitable, Interesting, Worthwhile, Important, Necessary, Obliging, Officious. Reversed: Peace, Tranquility, Repose, Sleep, Apathy, Inertia, Stagnation, Inactivity, Idleness [Unemployment].—Leisure, Pass-times.—Recreation, Carefree, Nonchalance, Indolence, Laziness, Doing Nothing, Dullness, Discouragement, Exhaustion. Serapis was always considered a beneficent god. I don’t see his connection to the Reverseds. Overall, this is a definitely sanguine word-list. I can’t see any connection between Apollo and these words. They are definitely melancholic, however. So there is some connection between the SB Knights and these lists, but not as much as with the pips. The Knights do reflect Marco’s assignments of suits with temperaments, but don’t have much sense of the Neopythagorean Twos. Elena is Helen of Troy, a sanguine type if ever there was one. Vanity and luxury are signs of optimism about the future—over-optimism, in fact. they pretend it’s a votive offering: this rumour spreads. ...So Calchas reads the omens. In other words, it's all to appease Athena for an earlier affront, or so the Greeks want the Trojans to believe. Why isn't Athena offended by this pretense in her name? The implication is that it was her idea, conveyed through her mouthpiece Odysseus. That's how Athena figures into the story: she's the one who sets off the whole calamity ending with the slaughter of Polyxena. She aids the Greeks with her cold, calculated ruse and her understanding of engineering. Next, how do these cards relate to the “Etteilla” lists? "ETTEILLA" QUEEN OF COINS: A Dark Woman, Opulence, Wealth, Prosperous, Luxury, Magnificence.—Self-Confidence, Reliability, Trust, Certainty, Affirmation.—Security, Boldness, Liberty, Candor. REVERSED: Untrustworthy, Doubtful, Unsure, Doubt, Indecision, Uncertainty.— Fear, Dread, Fright, Timidity, Apprehension, Wavering, Hesitation.—Undecided, Indecisive, Puzzled, A Person Held in Suspense. In Etteilla's 1773 book, he says for Clubs, "Femme brune. R. Chataine brune," i.e. "Dark woman, Reversed, brown-haired woman." Well, Helen of Troy, if shown looking at herself in a mirror, certainly would like liked opulence, and exhibited boldness. She was also untrustworthy, from her husband's perspective. "ETTEILLA" QUEEN OF SWORDS, UPRIGHT: Widowhood, Widow, Privation, Absence, Dearth, Sterility, Indigence, Poverty.—Empty, Vacant, Deserted, Idle, Inactive, Unoccupied. REVERSED: Evil Woman.—Bale, Malice, Trickery, Subtlety, Artifice, Mischievousness, Bigotry, Prudery, Hypocrisy. The 1773 book has, for Spades, "Femme veuve. R. Femme du monde, vous regarderez si c’est present, passe, ou avenir": "Widow. Reversed, woman of the world, you will watch if it is present, past, or future." Well, yes, In murdering her husband, Olympias becomes a widow. This perhaps relates the card to the 13th trump, Death. She is also an evil woman: malicious, subtle, and tricky. These are all choleric traits. "ETTEILLA" QUEEN OF CUPS, UPRIGHT: Fair Woman—Honest Woman, Virtue, Wisdom, Honesty. REVERSED: A Woman of Distinguished Rank, Honest Woman.—Vice, Dishonesty, Depravity, Dissoluteness, Corruption, Scandal. The 1773 book has, for Hearts, "Femme blonde. R. Chataine blonde": "Blond woman. Reversed, Light brown haired." Polyxena is virtuous, true to her country. And of distinguished rank. She was also dishonest with Achilles, betraying him to his enemies. "ETTEILLA" QUEEN OF BATONS, UPRIGHT: Woman of the Country, Housewife, Economy, Honesty, Politeness.—Gentleness, Virtue.—Honor, Chastity. REVERSED: Good Woman, Kindness, Excellence.—Obliging, Officious, Helpful.—Favor, Service, Duty. 1773, Diamonds: "Une Femme. R. Autre femme": "A woman. Reversed, Other woman." Pallas is a goddess of virtue, honor, and chastity, and probably also of housewifery, since she governs the art of weaving. However the attribute of science (as in the building of the Trojan Horse) is not mentioned in the above list. I don’t see how the traits mentioned are melancholy. I think the list reflects the agricultural meaning of Batons, not the temperament. With Polissena you're in the jungle of Greek mythology and the way, how the Greeks told their hero stories. There's a pattern of 18 fields, and heroes usually wandered through them, following a way from field 1 till field 18 ... the 18 fields had a structure 6x3 like 1-3, 4-6 etc. ... somehow "6 chapters with 3 sub-chapters" of the story and Polissena (in Achilles' case) presents field Nr. 13. Similar to Tarot, naturally, but according their own Greek logic. Field 13 had an equation to the sign "Virgo" and the self-sacrificing women. Achilles has clearly a doubled life with Theseus and the key-woman of this parallel life is Helena, cause she appears in both hero stories. The basic story of field 13 is Selene, moon goddess ... field 14 is brother Helios, sun god and field 15 is sister Eos, all three children of Hyperion and Theia (light). In "later" mythology Selene's function was replaced by Artemis ... with Apollo child of Leto and Zeus, which had field 6 ... and Apollo replaced Helios (field 14). Leto had field 6 (Gemini). Field 5 originally was Menoitios, the lost "human" in Tartaros, somehow expressed in the sleeping Endymion. Field 4 (old moon, Pisces) was the sister of Leto, who escaped Zeus and became Delos, the island. Her child was Hekate. That's all rather mysterious, and, as far I see it for the moment, it wasn't likely relevant for the way, how the 15th century viewed on Greek mythology. Thanks for the interesting set of parallels. Where can I read more about them? Is there some scholar somewhere? I don't see any indication that this set of parallels is of interest to the 15th century. What is of interest is the antecedents to the Alexander story, in Trojan War. And also, as I think the Kings will show, in the life of Dionysus. Alexander, as conquerer and dying young, is parallel to Dionysus. Polyxena is the virtuous contrast to Olympias. That's all I see for the 15th century. Dionysus, of course, brings in Ariadne, but I don't see her in the SB cards, or even a parallel, such as Alexander's wife. And here is Marco’s set of correspondences. Discs, Filipo: This is of course Philip of Macedon. A "small bird" comes and lays a strange egg, in the story quoted by Tarotpedia; it is not specifically a dove in the source; but it does look like a dove on the card, perhaps carrying an olive branch. Doves are associated with Venus, the goddess associated with the sanguine temperament, and also with peace, corresponding to the "PAX" on the man's banner. Swords, Alexcandro: Alexander the Great is certainly a man of the sword. Griffins are associated with fire, being sacred to the sun (per Strabo, cited in Wikipedia), and apply to Alexander as representing courage. I don't know that they were associated with Alexander specifically..
Cups: It is not totally clear what this name “Lucio Cecilio” is doing here. It is the name of several members of a distinguished family of the Roman Republic, mostly military leaders, some consuls of the Republic. The first one of note led a battle that resulted in all of the participants being destroyed, including him. After that they were more successful. As someone suffering an untimely death, he is like Alexander and Philip. I have no idea why, among the many soldiers dying in battle, he was the one chosen. Perhaps it points to some identifying feature of the author or patron of the cards. Batons, Levio Plauto: Marco has a problem associating this card with Earth, as lions are fire-animals. He also can’t understand what “Plauto” is doing here. I have a theory: it is a misspelling of the name “Pluto.” Marco correctly identifies “Levio” as Bacchus. But “Pluto” (or perhaps "Levio Plauto") is a name of chthonic Bacchus, Bacchus as a god of our return to the earth in death. Liber, his Roman equivalent, was identified with Pluto because his wife, Libera, was the goddess of the harvest, and so equivalent to Pluto’s wife Proserpine (this last at http://en.wikipedia.org/wiki/Proserpina).The Lord of the Underworld was even shown sometimes with Dionysian attributes, for example in this Greek relief in Calabria (http://en.wikipedia.org/wiki/Locri). Wikipedia identifies the man here as Hades. But he is holding grapes, and a thyrsis stands in front of him. 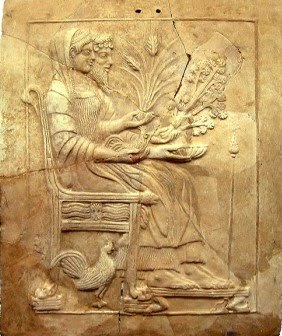 I doubt if the card-makers saw this relief; but they did know about Libera as goddess of agriculture, with Liber as her husband; they might also have associated Bacchus with Proserperine in the Eleusinian Mysteries (Bessarion mentions Bacchus at Eleusis in his letter to the sons of Pletho). If nothing else, they would have known about Bacchus as a god of death as well as life, so that the addition "Pluoton" makes that aspect clear. The lions in the card then stand for the chthonic fire that comes from the earth in the form of wine as one of its riches, and perhaps also for spiritual rebirth. We might also ask why "Levio Plauto" is included here among the kings. I think it is because all three mortal "kings" met untimely deaths. He is their god. Alexander imitated Dionysus in conquering India. And like Alexander, Dionysus went to the underworld soon after his return. "ETTEILLA" KING OF COINS, UPRIGHT: A Dark Man, Shopkeeper, Merchant, Banker, Stockbroker, Calculator, Speculator.—Physics, Mathematics, Science—Teacher [British: Master], Professor. REVERSED: Vice, Flaw, Weakness, Defective, Faulty Conformation, Misshapen Nature.—Dissoluteness, Ugliness, Deformity.—Corruption.—Arrogance. And Etteilla 1773, Clubs: "Homme brun. Rev. Chatain brun": "Dark man. Rev. Brown-haired." I don’t see much relationship to Filipo. Or to the sanguine temperament. It looks more melancholic. "ETTEILLA" KING OF SWORDS, UPRIHT: Lawyer, Man of the Law, Judge, Councilor, Assessor, Senator, Businessman, Medical Practitioner, Attorney, Public Prosecutor, Doctor, Physician.—Jurist, Jurisprudence.—Litigant, Jurisconsult. REVERSED: Ill-Intentioned, Wickedness, Perversity, Perfidy, Crime, Cruelty, Barbarity, Inhumanity. Etteilla 1773, Spades: "L’homme de robe. Tout ce qui y a rapport, non ces gens a intrigues du Palais qu n’ont aucune qualite. Rev. Homme veuf": "Man of the robe. All that pertains thereto; not those people who have palace intrigues and no quality. Rev. Widower." The SB card of Alexander the Great reflects the older meaning, applying to soldiers; the “Etteilla”--and Etteila 1773--reflect, I think, a slightly different one, one that connects the sword to the trump of Justice. Presumably the soldier fights for justice, but one never knows. "ETTEILLA" KING OF CUPS, UPRIGHT: Fair Man, Honest Man, Integrity, Equity, Art, Science. REVERSED: Distinguished Man, Honest Man.—Dishonest Man.—Exaction, Misappropriation of Public Funds, Injustice, Bandit, Swindler, Rogue.—Vice, Corruption, Scandal. Etteilla 1773, Hearts: "homme blond. Rev. chatain blond": "Blond man; Red-haired." Lucio Cecilio: The "Etteilla" list would be appropriate to a public official such as a consul of the Roman Republic. If the phlegmatic man is calm and harmonious with others, then both the list and a virtuous consul would fi it. "ETTEILLA" KING OF BATONS, UPRIGHT: Man of the Country, Good and Strict Man, Well Intentioned Man, Honest Man—Conscientiousness, Integrity.—Man Who Pursues Agriculture, Laborer, Farmer. REVERSED: Good and Severe Man.—Leniency, Austerity, Tolerance, Condescension. Etteilla 1773, Diamonds: "Un Homme. Rev: Un autre homme": "A man. Rev. Another man." 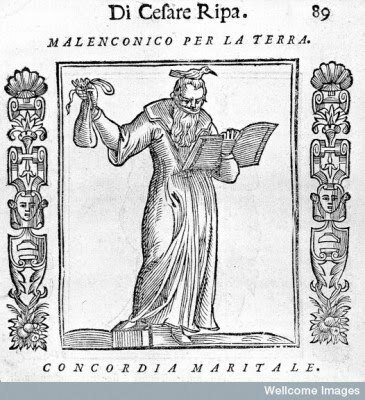 Levio Plauto: The "Etteilla" list would seem to characterize a devotee of Liber, god of agriculture. Severity austerity, and condescension are aspects of the melancholy temperament. To conclude: I have confirmed Marco’s correlations between suits and temperaments in the courts 100%. Also, I think I have been able to account for the exceptions he found to his generalizations. They are only apparent exceptions. For the swordsman with the lute, the lute is symbolic of the temperament he is striving for, sanguinity, as opposed to the one he has, choler. He does not look sanguine; and his look as well as his suit sign accurately reflect his temperament. It is the same as in the case of the page of cups, who holds a cup of fire. She wants to be more energetic. Her temperament is choleric, despite the fire. 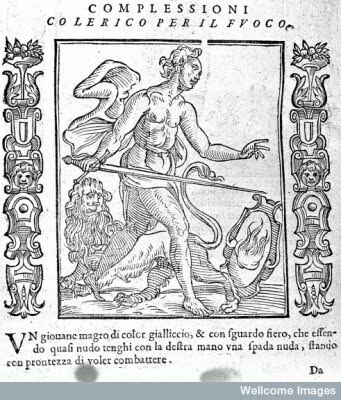 In the other case, "Levio Plauto," we can disregard the lions and understand Plauto as Pluto, equivalent to Liber, god of agriculture and the underworld, or Dionysus in his chthonic, i.e. earth, aspect. The lions are also of this world, the grape. I have also accounted for the dolphins in the Queen of Cups, as sacred to her helper Apollo. And I have shown how Pallas relates to the deck not only as the goddess of war, but primarily as the agent of the Trojan Horse. The biggest unknown for me in the SB Courts is just why Lucio Cecilio in particular is there. I have also delineated specific correlations between the court cards and the “Etteilla” word lists, suggesting to me that both might have been part of a continuous tradition, at some point including cartomancy. There are also some serious discrepancies, which probably can be explained by other influences on the “Etteilla” lists. And finally, I have to say that there is no clear evidence of Neopythagoreanism here, although the ranks 11-14 also don’t contradict it. Pages are naturally the beginning, with or without Neopythagoreanism. Queens naturally associate to marriage and children, but there is a perfectly good reason to include her: she holds a recognized position in Renaissance society as the wife of the King. Pages’ and Knights’ wives had no comparable status. And Kings are naturally the top of the suit hierarchy, with or without Neopythagorean sanction. Meanwhile, the Knights, which aren’t really necessary, have no consistent Neopythagorean characteristics. mikeh wrote: Thanks for the interesting set of parallels. Where can I read more about them? Is there some scholar somewhere? ... ... there was a book, written between 1985-1987 and then not really finished, cause there was no chance to publish it at the book market. Too complex. Then there was another book published which presented only essences of the research, which was a study of various systems of the past, between them I-Ching, Tarot and Greek mythology, but also parts of bible, Sepher Yetzirah etc., written mainly within 3 weeks. This book was published in 1988. Even this much smaller book wasn't understood by its readers. The same author found in May 1989 the 5x14-theory based on the condition, that he had gotten Stuart Kaplan, Encylopedia I as a birthday present and had also a book about the Sforzas (which formed his historical background in this moment) ... it took 2-3 weeks in its essence. The 5x14-theory contradicted some hypotheses from his earlier book, themes, on which he had worked on occasionally with some intensity since 1974. He abandoned the older theories and found no reason to propagate his earlier work very much. In 2003 he started Trionfi.com. ... ... in 2005 an Hungarian author and I-Ching researcher published a specific context about the structure of I-Ching. which he published via book and internet. József Drasny, a retired cybernetic engineer living in Budapest who is now in his seventies, wrote to me pointing out his exploration of a spherical model of the Yijing, which he calls the Yi-globe. In 2005 his findings were published in Hungarian under the (translated) title of The Forgotten Worldview of the I Ching: The Yi-globe. 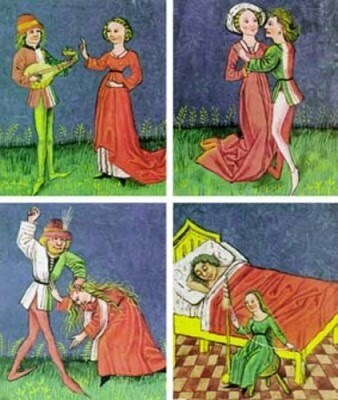 Practically the same form was published in Lothar Teikemeier's book, in the "Lyra, I-Ging gleich Tarot" in 1998 (Holos Verlag) and even in private edition, in 1988. He created this arrangement on the basis of special mathematical principles and named it 'ichingsphere'. The author used it to demonstrate certain relations between the Tarot and the I Ching. Presently, this diagram is connected to his site: http://www.trionfi.com. 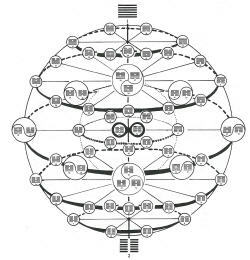 In the Yi-globe the hexagrams have been arranged according to another, independent method: following the Taoist principles and the words of the I Ching. It deserves attention that the resulting forms still coincide with each other. On this site the Taoist method comes to the fore and the new, inner qualities of the sphere are disclosed and analyzed. In the book it's a full page picture. József Drasny's work found some accepting reception in relevant I-Ching internet groups. For the reduced book "I-Ching = Tarot" it had been only a minor detail. For the parts, which concerned Greek mythology, they naturally were also very very reduced. The Achilles-Theseus-Helena part, as shown, is not included. But for the author this feature played a specific role, as he developed the opinion, that there was something more in Greek mythology, as he had perceived till then. There was somewhere and somehow a system, and this should have had some hidden similarities to a system, that he already knew very well (the mathematical part of the I-Ching). Later he developed the opinion, that not only Achilles and Theseus followed the same structural pattern, but also most of the other hero stories. But he also perceived,that not all Greek stories did fit the system, and when researching these via the authors, it became apparent, that mostly younger stories contradicted, but also partly the Homeric string. The "school with system" seems to have expanded from Hesiod and and its "Theogony"... this seems to have been a powerful influence, which were able to dominate the literary production for some time, such keeping the system intact. The system, so the theory, had memory function, it was organized in a way, that it was easy to recall to mind the details of the stories and helped to keep the row of action in order, avoiding contradictions between one story-teller and the other. Well, story telling was organized business ... that's a basic hypothesis. There were temples (and this was business) and the temples needed the story tellers, and it had to be avoided, that one story teller contradicted the interpretation of the others too much. Likely in the time of the philosophers the rhapsodes lost control ... some people started to laugh about them. The general distribution of the ability to write made memory systems superfluous, naturally in a small-step-development. Literature changed the world. It wasn't necessary, that everybody presented the same opinion. But it was possible, to recover parts of it (proven by the author by his own exploration), at each opportunity, when some enthusiasm about the old stories existed.So it was possibly also recoverable during the renaissance ... but for this assumption evidence is missing. The Jewish kabbala blossomed from the same mathematical tree. The Seher Yetzirah contained parts of it, possibly based on a historical string, which existed independently or half independently from the Greek poets version. And the system of I-Ching survived in a living tradition more than 3000 years, more or less always rather accepted in all times. Well, far away in China. Well, Tetraktys, what do you think, that it is? "1+2+3+4=10" ... would you think, that it is all? This is the basic model of the I-Ching system, offering according its system 4096 possibilities to describe a closed system of "situations of life". Well, somehow "only" a lot book. 4096 is actually (1*2)^(3*4), so using the same 4 most simple numbers as the 1+2+3+4 used in the common Tetraktys model. Indeed Western culture had finally composed more complex lot books. The sophisticated side of the I-Ching, however, it is, that at least in its begin it avoided unnecessary complications (later it transformed and took wild contradicting forms as additions, which created confusing effects; but this happened also in Western esoteric). Let's compare I-Ching and Tarot. It's easy to create another tarot game structure, just use other numbers. 5x14 is just one alternative, but there are many, and the complete number might be astronomical and a lot of these variants might be comparable "in number elegance". Similar Chess: There are thousands of possible variations. If we take the game of Go ... it's very difficult or impossible to create a game which is similar to Go and needs similar few rules. Sure, you could variate the size of the board, but this wouldn't change the game too much. If we take I-Ching, there are similar qualities as in Go, you could change the number of lines 2^4, 2^5, 2^7 etc. or the number of possibilities per line, 3, 5, etc, but you would get the effect of "less elegant numbers". 1,2,3,4 have simply the quality to be the lowest numbers and there are no others ... well, and this makes the I-Ching "most elegant". 4096 possibilities are for the human mind enough complexity. A similar concept might have been in the mind of the Pythgoreans, when they chose the Tetractys as "great symbol". Pythagoras lived in the time, when the Rhapsodes ... (I've to tell, that I interpret this term in my own meaning as that group of persons, which were responsible for the stability of the observed poetical system, not in the perhaps common meaning as singer as it is presented for instance in wikipedia ... perhaps the expression "mythmaker" or myth-conservators would be better, but perhaps it is a little bit funny ...) ... likely still had a good position in the societies. If the basic observation is correct, that this group used complex mathematical systems as memory structures, it's hardly conceivable, that Pythagoras and his school with its special attention for mathematical elements at the same time used something, which was with evidence much simpler. Actually one has to assume, that the Pythogoreans knew about the technical tricks of the rhapsodes and naturally also their professional behavior to keep such things hidden, and that they made their mathematical ideas of the world on top of that, what was already known to the rhapsodes (and they also kept their secret). So: what's the mystery of the Tetraktys? 1+2+3+4 surely not, that's a joke. A mental concept of the complexity of the I-Ching is even for the modern mind not easy to explore. The rhapsodes had their quality in the practical use of the memory system, not the puristic mind of mathematicians. Their elements were words and the necessary show, perhaps singing and some drama in the voice. There's a key scene in the Oedipus myth: Oedipus meets the Sphinx: "What runs at the morning at 4 feet, at high noon with 2 and in the evening with 3?" Oedipus says "Man". Mythanalytic says: "There are the numbers 2, 3, 4". One needn't to mystify this, it were poets. They played with the system. They made jokes in their myths. Thanks for your outline of a complicated system, Huck. I don't know what to make of it, of course. And you already indicate the difficulties: China is far away; evidence is lacking. Well, without theories we don't know what to look for. So I will be looking. I have wondered myself what else the Tetrakys could mean. I don't know. The Decad or Totality is quite a bit in itself. As to 2 to the 12th power = 4096 as a product of the sequence 1, 2, 3, 4: well. I would need evidence in the Pythogrean writings. Oedipus's riddle as 4, 2, 3, 1 (1 as the answer, Man) makes sense. But it's a stupid riddle, many people could figure it out. I don't see anything profound in it. I haven't found any Pythagorean talking about it, either. I am quite convinced that the Kabbalah came out of Neopythagoreanism, at least the 10 sefiroth. The coincidence of time and place is too strong. I don't know about the Sefer Yetsirah. Or about complex mathematics. Just the symbolism of the numbers from one to ten. I had a few other thoughts about the Pages, which I added in red to what I already wrote. Nothing major, just a few additions. mikeh wrote: Thanks for your outline of a complicated system, Huck. I don't know what to make of it, of course. And you already indicate the difficulties: China is far away; evidence is lacking. Well, without theories we don't know what to look for. So I will be looking. Well, for this topic one has to go back in time, before the Greek, before the Jews, just to the simple problem,how to organize social memory without generally introduced writing forms for instance, but also for the simple number problem, how to count. We have (mainly) a solution based on number 10 in math for counting (I think decadal is the right term in English) ... it's not the only way. Beside this the sexagesimal system existed, further a system based on 20. Even when the decision was done for the system based on 10, then there were puzzling variants, the Greek counted with letters, the Romans used a system based on abacus logic. Our own system with "0" is rather young. Between the jungle of possibilities was also the binary solution. This was for instance very practical for counting ancestors (genealogy naturally produces binary trees) and also in weighing systems ... take a stone, search for a stone of the same weight and then search with the help of the two stones for a stone of the double weight. Proceed with these steps, till you have enough stones to sell your carrots or whatever. This latter system is said to have been used in India 1500 BC, but likely it was developed much earlier and also elsewhere. The 6 elements were used to describe 1/2, 1/4, 1/8, 1/16, 1/32 and 1/64 of a hekat. Likely the "sharp eye of Horus" underlined, that this had been an equivalent value as the metrical system of nowadays. The decadal system did win in most cases, likely simply caused by the condition, that the human had 10 fingers. A System based on 12 (= 3x4) and 60 (3x4x5; had the greater advantage, that it knows partitions of 3 and 4, but this math was mainly used only for time measuring, astronomy etc.). Binary math is easier than other systems (although it appears as "complicated" for a modern mind), but for higher numbers it becomes "too complicated". As the advance in trade developed a "higher number reality", it was suppressed in the "background", used for mythical explanation ... for instance. So we find it in the stories of mythology, which became mystified and more mystified and much more mystified with the time. We don't have to look to China (the I-Ching is said to have had its origin ca. 1150 BC). Old Egyptia had a mythological structure 22-20, realized as a system of political departments (such as the United States have their 50 states or some more nowadays). But it was an idealized number, occasionally there hadn't been 42 political departments, but some less. 22 departments were given to upper Egyptia, that's the region, which is dominated only by the river Nile. So these 22 departements build a natural row ... just like the cards of Tarot have a row. 20 departements were located in the delta of the Nile, and naturally they are also dominated by the waters of the Mediterranean Sea and its very different conditions. Each departement had its "Standarte"
... so a painting or combination of hieroglyphs. Each departement had a god in the underworld, which had to be satisfied by the dying person. They're usually only badly reported in modern Old Egyptia literature ... well, a sign, that their meaning isn't really understood ... ... the world doesn't know the mysteries of the binary system. What's 22 + 20 ? It's not necessary, that any Chinese report reached Egyptia or that any Egyptian report reached China. The binary math could have developed everywhere, and its value for mythological interpretation was also given everywhere. The political system with the 42 departments is said to have existed ca. 2400/2500 BC in Egyptia. There's evidence with (hekat, Horus eye), that the Egyptians gave the binary scheme some importance. It's very likely, that the choice of 42 (20-22) departements was an idealized political structure, not created just by factual existence. So the choice is a reference to the binary system, somehow presenting a system inside Egyptian mythology, part of the systems, that Pythogoras might have learned during his travels to the east (... ... in the case, that he didn't know the system already from other locations, which actually seems probable). I hope you got that ... the whole object is really very old, it existed long before the Greek poets and before Pythagoras. Why 22-20 and not 22-20-22? Well, it are 22-20-22, but the latter 22 departements were in the Sea. That's what we have to conclude from this condition. Egyptia had dreams of expansions and occasionally these realized, when the Egyptians took parts of Phoenicia and elsewhere. The Biblical myth tells, that Moses had been an Egyptian prince, which naturally also had an Egyptian education. The bible even tells us, that he wasn't a great speaker, and he used his brother Aaron at such opportunities. Actually this means, he had language difficulties, likely he well might have told his story in Egyptian tongue, but talking with the Jews had this difficulty ... similar problems I've with my not always perfect English. So Moses, educated by Egyptians, knew the 42 gods and their mystery with the binary elements. Moses left 10 plagues in Egyptia, went on mount Sinai and got 10 commands, and then possibly formed a new Hebrew letter system containing 22 letters. Well, and finally at the redaction of time of Sepher Yetzirah, maybe 1500 years later, we have that there 32 ways of wisdom, with which god had formed the world. And according this Abraham, long before Moses and the stay of large Jewish population in the Delta region of Egyptia, got these elements. Well, all, what we know by historical research elsewhere, it seems, that the Phoenicians formed the 22 letters. But the redaction of the Pentateuch, possibly around the time of King David and King Salomon, would have preferred, that Moses invented it. Or others active in the oral tradition loved this version. Well, also they would have loved, that Abraham did it. But this sort of system lived already 2400/2500 BC in Egyptia and that's a little bit older than usually Abraham's life is calculated. What was done? Moses (or simply the time) had transformed the mythological interpretation of the Egptians into a Jewish interpretation. The deciding change was, that Moses left 10 plagues in Egyptia. Left were now 32 ways of wisdom on the Israel-side and 42 political departements in Old Egyptia, which more or less became unknown with the time. But the essence of both systems was the same. The new Jewish kingdom couldn't invent the binary tree and its mysteries. In the I-Ching you have 64 hexagrams, but with an easy mathematical step you can change this system to 32 units, just by uniting complementary hexagrams, as in 111111 / 000000 and in 111000 / 000111. You get 32 "meta-symbols" consisting of two opposite hexagrams each ... and precisely this was done in the Sepher Yetzirah. Sepher Yetzirah and I-Ching talk of the same mathematical scheme, just in "different interpretation". ... ... there you also find some heroic fight with the system of the Greek by Huck. Not very elegant, and "unfinished", but perhaps an orientation. Well, that's a sort of 5x14-theory for another field ... for the moment still not developed. Very sure in it's basic, even more sure than the 5x14-theory. This was also a part of the book from 1987. Meanwhile I have a simpler question: where are all those parts of the Theseus story written down? I didn't know about some of them. Ranke-Graves is very good, as he summarizes various alternatives of the stories. Generally I would assume, that we have in Germany better sources, as the humanistic interests in 19th century were very big. There's a dictionary like Pauly-Wissowa, which fills about 1,5 x 2 meters, all in big books. This is a dictionary about the old antique world, created by scholars in about 60 years or so. This is updated in a new version in slow steps, but the older version seems better. Also, there are several important parts of his story that you didn't mention. It's not all relationships with women. Are they then "late additions"? I mean things like his father's suicide, his fight with the Minotaur, and his own later descent to the underworld. ... well, naturally I reduced the story, that you get a glimpse of the story, but that you didn't become confused by the complexity, which is the greater danger. The death of Aigeus appears at field 8-9. Field 8 (planet Venus "nowadays", but' that's a specific mystery) is reigned by Athena and Hephaistos, that is sexually frustrated gods, in contrast to its mirror field 11, which is dominated by Venus-Mars (sexually fulfilled gods, they get children). Between the field 9 /10 is a sharp contrast, that's the abyss of the system ... which in the case of heroes is somehow simply adolescence. Theseus is ready with the field 9, so the old king (Aigeus) has to disappear. Athena and Hephaistos, the frustrated, are the city gods of Athen, so somehow the Athen question is also at field 8. Field seven, reigned by Taurus, offers often elements of Kreta (the cult of the bull as foes to Athen, which earlier had dominated Athen ... Athen had to pay tribute; Creta had been for Athen something like England for the English colonies in America before the independance war). Generally field 7-9 present problems of Athen, whereby field 10-12 have some connection to Theben or to other "foes" of Athen. ... and this was a very dominant man in Athen, so this raise of Theseus to the one dominant city hero was no small act. Generally Athen started to dominate Greece, so it has to be assumed, that mythology then likely was partially forged into Athen's favor. If you take the Homeric Trojan war (earlier than Hesiod), you see, that the representative of Athe, Menestheus, is only a minor person for the story. If you leave it aside, not very much would be changed. So it might well be, that specific elements of the story, which satisfy the system and which make Theseus similar to Achilles, might have been brought in by Peisistratos. Theseus looked in this way as great as Achilles and Achilles was great by Homer, that is a story, which was built with some contradictions to the Hesiodic system and which somehow ignored the importance of Athen. Athen hadn't been so important before, Peisistratos attempted to change this. I don't know Campbell. The story, that Achilles and Helena married in paradise is only a side variant of the major line of mythical development. This might well be organized by Peisistratos. Generally this interpretation, as I give it, is NOT covered by other researchers. It is something like the 5x14-theory ... totally different from other interpretations, selfmade. Based on the condition, that its author did know the mythological use of the binary system very well ... and others even didn't think of such a component. That the Sepher Yetzirah and I-Ching are based on the same mathematical model, had been occasionally presented as "one sentence ideas" before, but nobody went so far, that one could prove it in detail. Similar situation. I've shown you the matter with the I-Ching-Sphere, which was recovered by the Hungarian I-Ching researcher 2005. Same situation. All these discoveries depend on the condition, that the element of the binary system was hopelessly misunderstood, not correctly presented or really researched till its base. Well, we have notes, that they (not only Pythagoreans) had mysteries and protected these. The riddle of Oidipus is positioned at a keypoint of the story. The answer "man" is only a further way not to tell the truth about the system. Each of this 6 heroes killed monsters with descend from Pontos-Gaia. Oidipus killed Neoptolemos, son of Achilles, son of Thetis, daughter of Nereus, son of Pontos-Gaia. Theseus is the counter figure to Oedipus (son-father relation). In both cases a chariot is related. In Theseus' case he is also somehow related to the death of his own father (black sail). Well, one could say, the ship killed the father. In the hero movements from field 1-18 the elements "ship" and "chariot" appear connected to field 9 and field 10 (more field 10), so somehow connected to the Abyss between 1-9 and 10-18. Concrete it means "the now grown-up son" (field 9) takes the position of his father (on ship or on chariot) at field 10 (now starting his grown-up life ruler; Oidipus becomes king, Theseus becomes king). The metasystem is a story which is told somehow of the "begin of the time of the heroes" (Perseus) till the somehow official "end of Greek mythology" (Orest).